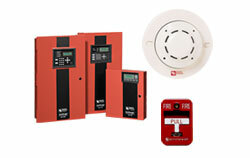 We provide both conventional and addressable fire alarm systems. From just monitoring a sprinkler system, to a large hotel or apartment, we can design and install a fire alarm system that will meet code and we work with your AHJ to ensure acceptance of the system. Our manufactures include Silent Knight and System Sensor among others.